3 weeks on NYT bestseller list - LA Times and Publishers Weekly bestseller - New York Times "Notable" book - Wall Street Journal "Best of 2012"
After the dissolution of the Department of Tourism, Milo’s old boss, Alan Drummond, grows obsessed with revenge against the man who’s destroyed his life: the Chinese spymaster Xin Zhu. When Alan disappears in London, having traveled around the planet, to reach the UK, clues are few and questions numerous. In China, Xin Zhu tracks evidence of a conspiracy against him (and his young wife) as he tries to survive the intrigues of Beijing politics. In Germany, Erika Schwartz comes across signs that Tourism may not be as dead as it seemed to be. In the center of it all is Milo Weaver, trying to stay alive and protect his family in Brooklyn. Things always become much, much worse before they can become better. That’s one of Tourism’s first rules. This ambitious, complex story spans the globe. Even when the intricacies of its plot are most challenging, we are fascinated and swept forward. Steinhauer has been likened to John le Carre and rightly so. Both men carry readers deep into a rival spy agency, one Soviet, one Chinese…Zhu may in time be to Weaver what the Soviet spymaster Karla was to le Carre’s George Smiley. Olen Steinhauer’s Milo Weaver novels are must-reads for lovers of the genre. By the end of “An American Spy,” there is a tantalizing hint that those left standing will live to spy another day. This reader certainly hopes so, as will many who succumb to the seduction of Steinhauer’s irresistible masterwork of love, guilt and revenge. Not since John le Carré has a writer so vividly evoked the multilayered, multifaceted, deeply paranoid world of espionage, in which identities and allegiances are malleable and ever shifting… Real espionage is actually like this. …the action is lickety-split and spiked with exceedingly satisfying spy craft. highly charged … Olen Steinhauer is one terrific story plotter. In these three books you expect the unexpected. … fiendishly clever. superb … Elevating these modern noir elements are Milo’s moral complexity, and the rich, often ironic personal details of the lives of some very bad people indeed. stunning … Steinhauer is at the top of his game — but when isn’t he? 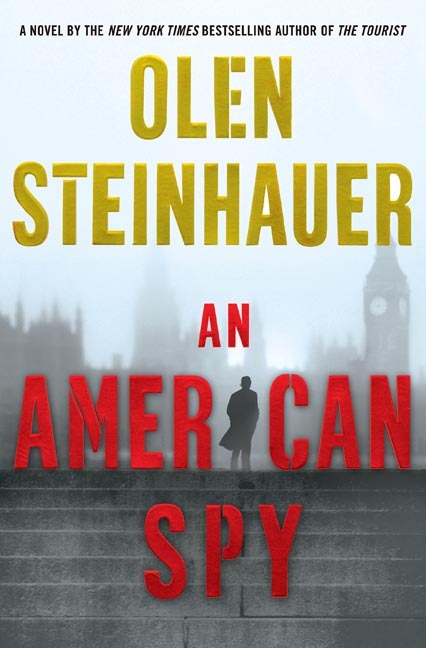 Steinhauer does for Chino-American espionage exactly what John le Carré did for the Cold War, which gives his thriller a unique insight into this treacherous half-lit world in the 21st century. The plot unfolds with such ease, grace and force that you simply don’t want it to end. Right now the hottest name in [the spy thriller genre] is Olen Steinhauer. He’s been called John le Carré’s heir apparent, and the best espionage writer of his generation. For anyone who reads spy novels, that’s high praise. Excellent…Steinhauer is particularly good at articulating contemporary spy craft—the mechanics of surveillance and intelligence in the digital age and the depth of paranoia endemic to the trade. In addition, his ability to create characters with genuine emotions and conflicts, coupled with an insightful and often poetic writing style, set him apart in the world of espionage fiction. The best spy novelists have long shaded their stories with the gray of moral ambiguity and Steinhauer works in that tradition while deconstructing James Bond even further. Political considerations play almost no role in this dizzying, dazzling array of hidden agendas and confused allegiances; all motivations are personal and the ultimate goal is survival. […] Another must-read from the best novelist working in the tradition of John le Carré. This follow-up to The Tourist and The Nearest Exit proves the adage that good things come in threes. With Milo Weaver as the conscience-worn hero, Steinhauer does for Chinese-Western intrigue what John le Carré did for the Cold War era of international espionage. A mesmerizing series for dedicated readers of spy fiction.